Recently, Microsoft has launched the new and updated version of Microsoft Graph Explorer. The concept behind the Microsoft Graph API and the Microsoft Graph Explorer remain the same, but this launch is an effort by the Microsoft Graph team to make developer experience more engaging and to add more functionality to Microsoft Graph Explorer. I have already written an article on the previous version of Microsoft Graph Explorer here while it was in effect. But with the launch of a new version with new UI, things have changed in Microsoft Graph Explorer. So, I wanted to write an article on it which will guide you through the new version. This article is part 1 of the multipart series I plan to write on the new Microsoft Graph Explorer. Please note that this article is written in a way that it can be read as an independent article without the need to look at my earlier article. Remember, there is no way to access the old version of Microsoft Graph Explorer. It has been totally replaced by the current version. My first impression is that you are going to like it much more than the old version. Before we start with what’s new in Microsoft Graph Explorer, let’s first get a quick introduction of Microsoft Graph. So, in a nutshell, Microsoft Graph gives you a single REST API endpoint which you can call to interact with “almost anything” in Office365. It delegates calls to different Office 365 cloud services via one single endpoint. Now, let’s learn about Microsoft Graph Explorer. Microsoft Graph Explorer is a fantastic tool if you want to work with Microsoft Graph APIs or if you are learning to develop with Graph APIs. Consider it as a developer sandbox or a playground where a developer can have first-hand experience of Microsoft Graph APIs. 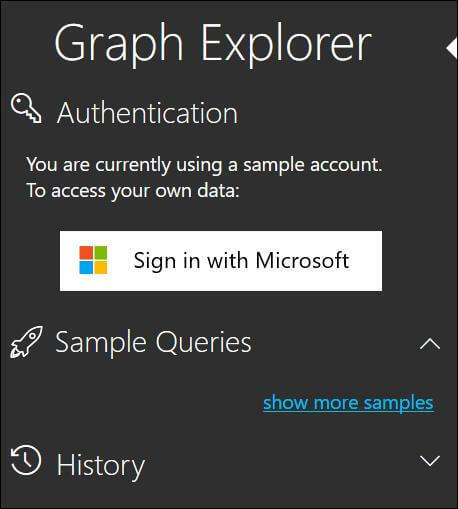 Where can you access Microsoft Graph Explorer? What do you need in order to work with Microsoft Graph Explorer? 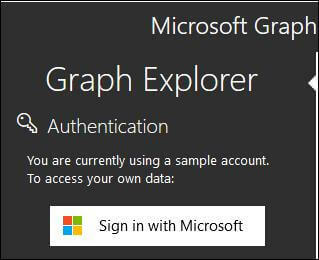 Microsoft Graph Explorer provides you default login – a sample account with which you can fire some GET calls using Microsoft Graph APIs. But if you want to explore more and also want to fire POST, PATCH and DELETE calls to Microsoft Graph API, then you will need to login with Microsoft credentials. I will suggest you get an Office 365 developer account. A word of caution here; never play with your live Office 365 data or work account here with Microsoft Graph APIs. You may accidentally update or delete some important information. It is advisable to use a test/demo account. If you join the Microsoft Office 365 developer program here, Microsoft will give you one year free Office 365 developer subscription for non-commercial use with 5 users. You can read more on it in my related article “Office 365 developer program” here. What can you do with Microsoft Graph Explorer? 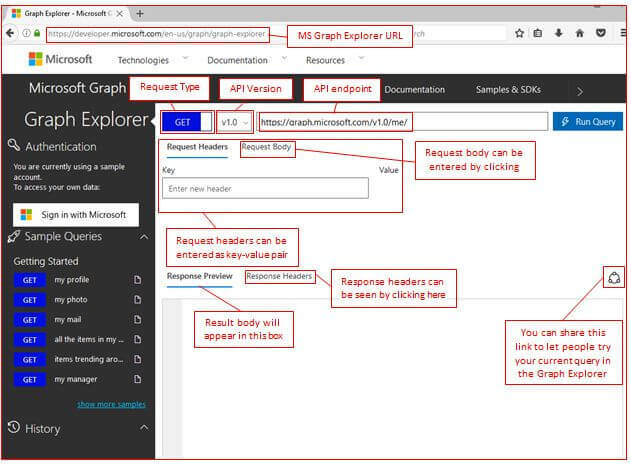 Microsoft Graph Explorer gives you a test client to access whatever you can access with Microsoft Graph REST APIs. Access/Modify data from Office 365 and other cloud services like SharePoint online, OneDrive, etc. In short, with Microsoft Graph Explorer is a one stop shop for everything you want to play with in Graph APIs. Why should you use Microsoft Graph Explorer? 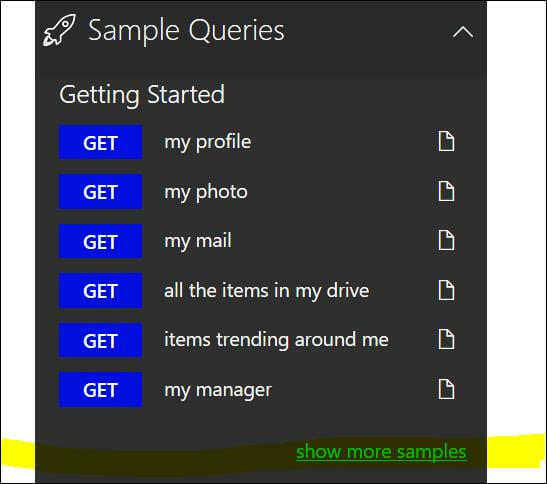 The screen shot of the new Microsoft Graph Explorer with some annotations above is mostly self-explanatory. 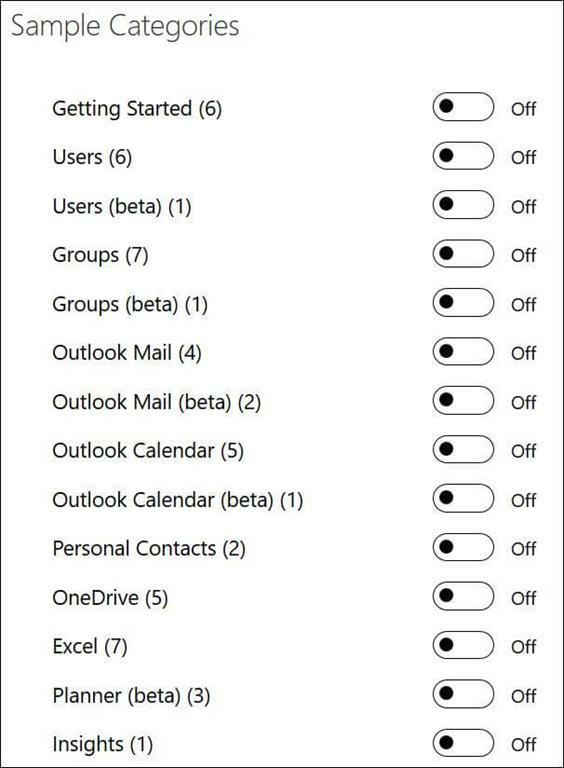 You are not allowed to change the request type if you are not logged in with your Microsoft account. This is because someone can fire update/delete calls to Microsoft Graph API and change the data in Microsoft sample account. So, for the sanity anything except a “GET” is disabled till your login. 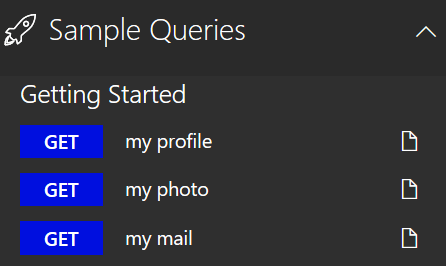 Once your login with your Microsoft credentials is done, then you can fire more queries apart from “GET” request type. There is one more use of this sample account I have found. It has bulk data for messages and other items. 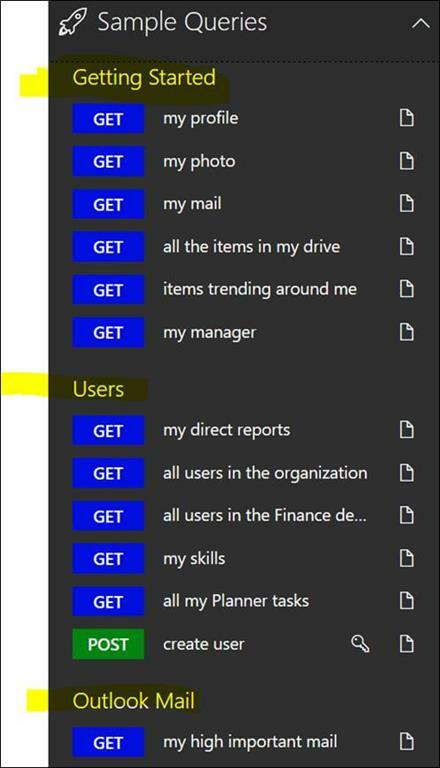 Your newly created Office 365 developer account may not have that much data until you do the laborious task of creating it into your account. So when you want to test paging, delta queries, etc. this sample account comes into help. Here you will find some frequently used API calls labelled under “Getting Started”. 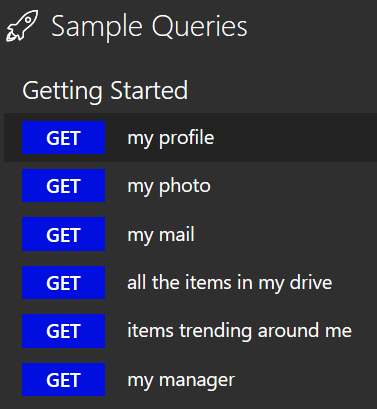 The purpose of the sample queries section is to provide developers a ready-made API call which can be immediately executed in the Microsoft Graph Explorer without the need for the developer to go and find the API URL and input parameters in documentation. 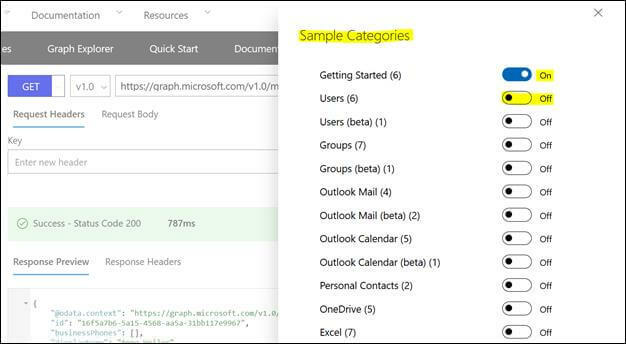 You can directly click on any link in the “Sample Queries” section and that call will be fired immediately against the Graph API and result will be shown to you. 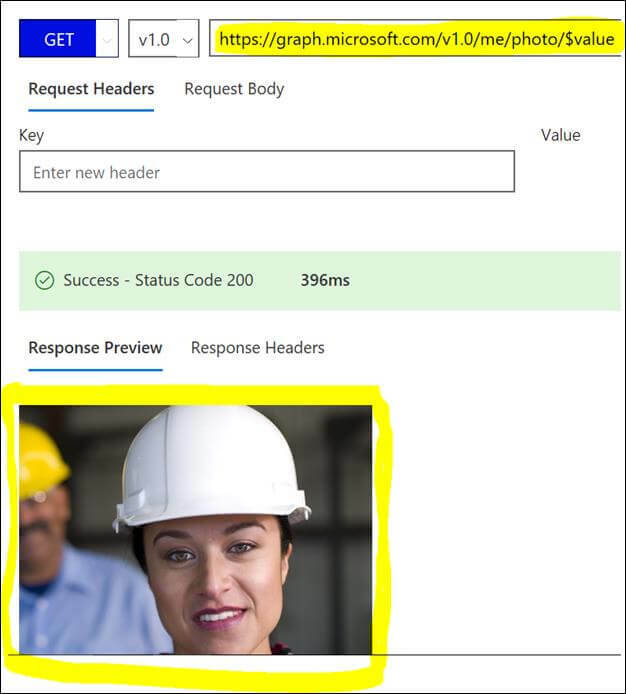 The Graph Explorer automatically changes the API endpoint to https://graph.microsoft.com/v1.0/me/photo/$value, fires the query and shows you user’s photo. The first column indicates the type of API call, which is “GET” here. The second column indicates a brief name for the API call. 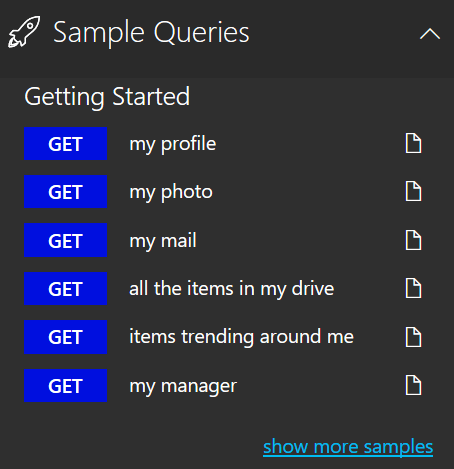 Do you want to see some more sample queries? You can click on any call to get it fired and see result in Microsoft Graph Explorer. 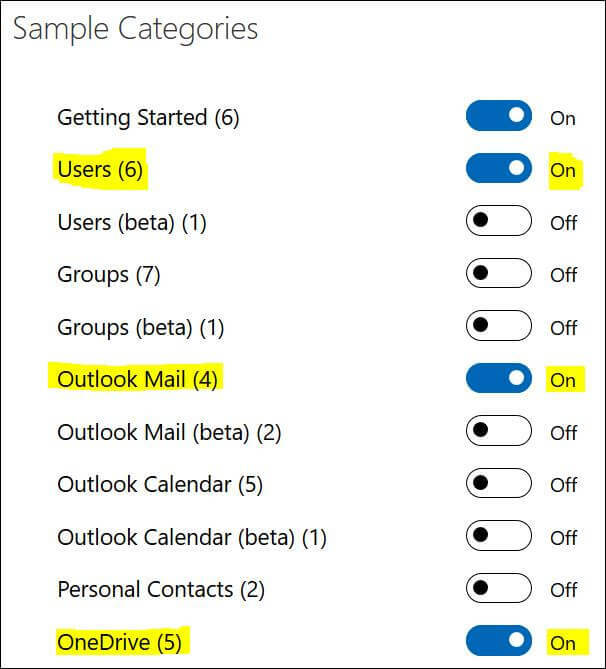 This flow is just to show you how you can make category selection “on” or “off”. I will suggest you to check all the categories and all its queries once at least. That’s it for part 1. I will cover more in part 2 of this series. See you in the next article. Until then – Happy Learning! Note: This article was first published by me on C# Corner website on May 09 2017 here.